Germany says it wants Greece to remain part of the eurozone and wants good relations with its fellow EU member. However, Chancellor Angela Merkel concedes Athens must commit to implementing structural reforms to pay back the bailout money. Greek Prime Minister Alexis Tsipras made a trip into the lion’s den on Monday for talks with Merkel concerning the progress his country is making to pay back the bailout money Athens owes. In his first trip to Berlin as PM, Tsipras added that Greece was taking steps to increase the collection of taxation and also stamp out corruption. However, perhaps his biggest message was one of trying to form unity between the two nations and leave bad blood between them in the past. "Please, let's leave these shadows of the past behind us," Tsipras said, stressing that the European Union could help stabilize Greece. "Today's democratic Germany has nothing to do with the Germany of the Third Reich that took such a toll of blood," he said, which comes on the back of disputes Athens and Berlin have had concerning the payment of war reparations dating back from the Nazi occupation of Greece during World War II. He added that stereotypes that had been created over the last few years needed to be broken. “Neither are the Greeks lazy, nor are the Germans responsible for all the ills that take place in Greece," Tsipras said. Government spokesman Gabriel Sakellaridis says Greece will present a package of reforms to its creditors, which will “be done at the latest by Monday,” he told Mega TV, according to Reuters. 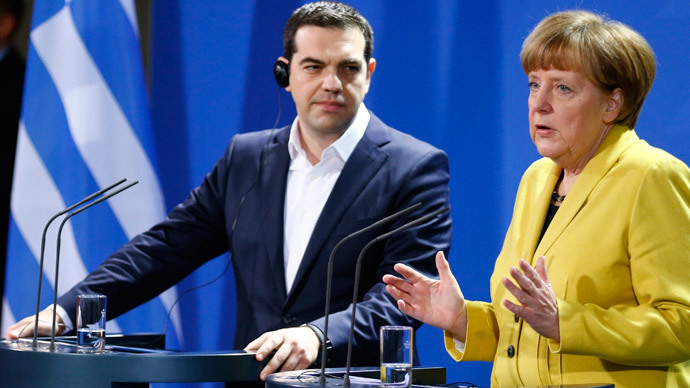 Greece says it is instigating these reforms, which have been championed by Germany. Speaking to RT, Greece’s Minister for Administrative Reform Giorgos Katrougalos says he believes Athens is making progress and that his country is seeking a better understanding and a better climate between the two sides. “The writing off of the debt is now not on the table and we are now at a kind of bridge between the former austerity program and what we hope to achieve for June, which is a new contract for growth for Greece,” Katrougalos said. “What we are trying to achieve is to have time and political space in order to implement our social program of reform to provide immediate relief to the victims of a humanitarian crisis and to the poor and the disabled,” Katrougalos added, speaking to RT. The EU is currently holding back crucial financial aid, which is needed by Greece. Some officials from the eurozone claim Athens could run out of money by the end of April. Last week, the Greek parliament passed a “humanitarian crisis” bill, which would provide relief emergency housing and food to the country’s poorest, despite attempts by the European Commission to scupper it. During his talks with Merkel, Prime Minister Tsipras slammed the EU for putting Greece in a situation in which tens of thousands of people are left starving. “Is this the Europe that we are dreaming of? Is this the Europe that we are building? This is the Europe that with its choices has triggered a humanitarian crisis and admits it did so,” Tsipras said in his speech at the Bundestag in Berlin. A poll by the German state television channel ZDF states that 52 percent of Germans want Greece booted out of the Eurozone. However, this was not a sentiment shared by Merkel, who says she’s committed to Greece staying within the single currency and considers all European states as equals and wants good relations with all of them. Merkel added that she had “high hopes” from her meeting with Tsipras, a phrase that was greeted by much laughter from within the German parliament, how like many German’s have grown tired by what they believe is a Greece that is failing to stick to its promises. Greece has said it is impossible to make debt payments if it doesn’t receive more financial help in the next few weeks. Head of the European Central Bank Mario Draghi says he’s ready to start supporting Greece’s banks again, as long talks between Athens and its creditors get back on track. This is seen as crucial for Greece as it would allow the country’s banks to tap into ECB credit, by using Greek government bonds as security. At present, Greek banks have been forced to borrow money at higher rates from the Greek central bank.